Goat Mountain is located in the northeastern portion of the Boise Mountains. The range isn’t typically known for overly rugged terrain, but the area around Goat Mountain actually has quite a bit of rugged personality. Goat Mountain itself isn’t a single peak; it’s more of a complex really, with a number of peaks and sub-peaks formed by a small group of intersecting ridges. I’d wanted to get back and check out Goat Mountain ever since seeing it during a climb of Wolf Mountain a few years ago. When Erik invited me to join him for a climb, he didn’t have to ask twice. After a 3-hour drive from Boise, we made it to the saddle above Big Silver Creek by 8am. The road didn’t seem as bad as my prior visit, so maybe they’ve done some work on it. There was already a couple inches of snow on the ground, and the forecast was for more snow in the afternoon, so we knew there was a chance we’d have to put the chains on the truck to climb back up out of Trapper Flats. From the trailhead, we headed straight up the ridge through an old burn area, crossing over some fresh wolf prints in the snow not far from the truck. We made steady pace toward Point 8625’, taking in great views of the Sawtooths that got better and better as we got higher. From 8625’ we turned west, and soon had a good view of the ridge leading toward North Goat Mountain (Peak 8970’). After a brief discussion about staying on the ridge, we decided that the safer bet would be to drop down to the small frozen lake, then climb up the southeast ridge of North Goat. This ended up being a great choice since it gave us the chance to check out the scenery form the lake, with some cool looking cliffs above the lake. 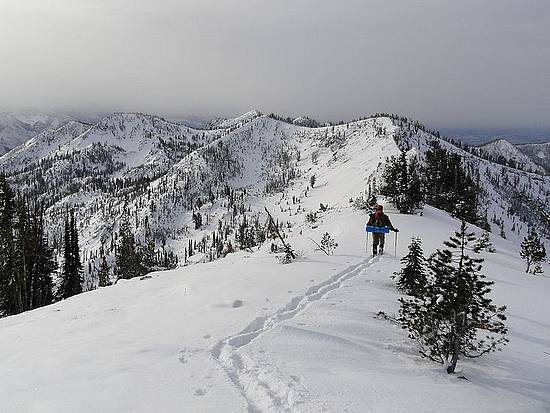 After spending a little time taking in the views from the lake, we headed south for a short distance, and then climbed up the southeast ridge of North Goat Mountain. Small cornices were already starting to form on the ridge, but they weren’t deep enough to slow us down too much. Once up on the main ridge, it was a short and easy side-trip to the summit of North Goat. From there we had good views of the long undulating ridge leading south to Goat Mountain. The low cloud ceiling and dusting of snow on the trees made for some cool scenery as we made our way long the ridge, crossing a couple false summits along the way. We stopped for a snack break near Pt 8870’, where we left our snowshoes and some other heavier items so we could make a quick dash to Goat Mountain. Soon enough we reached the named summit of Goat Mountain (8835’) located where about four different ridges intersect. Form there we continued south to the true highpoint (8915’) where we found a summit cairn and register with a few familiar signatures. Based on the entries, it looks like this peak averages about one summit visitor per year. After taking a bunch of photos, it was time to head back. It was now spitting snow, so we decided it would be wise to pick up the pace to keep from getting stranded 22 miles form the highway in a sudden snowstorm. There was some discussion about dropping down into the lakes for a flatter side-hill traverse back to the truck, but ultimately we decided it would be easier on Erik’s ailing knee if we just retraced our steps back along the ridge. This was fine with me since the views up high were very good, and we could see that the lakes below were already frozen over for the season anyway. So back along the ridge we went, with more uphill along the way than either of us remembered during the hike in. Soon enough we made it back to the first frozen lake, followed by a 300’climb back up to Pt 8625’, and an easy descent back to the truck, where there had been almost no snow accumulation during the seven hours that we had been gone. It was a great day in the mountains. We definitely snuck one in, since I’m sure that the next day’s snowstorm will keep the road snowbound until spring. Great times with great company. Erik and I were already planning our next snowy climb during the drive home. Map of the route, just under 8 miles round trip with 3100 elevation gain. Snowy trailhead at the saddle above Big Silver Creek. Good view of the impressive northeast face of North Goat Peak. Zoomed in view of the Sawtooths taken from near Pt 8625'. Erik climbing the ridge toward Pt 8625'. The ridge leading from Pt 8625' to North Goat Peak. View southwest of the many points along the ridge to Goat Peak (distant left). Panoramic view from the frozen lake east of North Goat Peak. ErikP photo. Dave nearing the summit of North Goat Peak. ErikP photo. Erik following the ridge south toward Goat Peak. Dave heading south along the ridge to Goat Peak. ErikP photo. Passing by an outcropping on the ridge. Continuing south along the ridge. Winter scene on the Goat Mountain ridge. Dave looking south from the named summit, toward the highpoint. ErikP photo. Erik leaving the named summit, heading toward the true highpoint. One last obstacle before reaching the Goat Mountain highpoint. Erik nearing the summit of Goat Mountain (8915'). Erik taking photos from the summit. Splattski style shot on the summit of Goat Mountain.